Plaza Cristobal de Colon, s/n, 07638 Colonia Sant Jordi, Spanje. 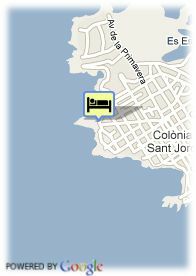 The Hotel THB SUR MALLORCA is located in Colonia de Sant Jordi, a small fisher port in the south of Majorca as its name suggests. It is surrounded by 10 km of virgin beaches, such as the famous beach of "Es Trenc", which are considered the best of Majorca; and it is only 54 km far from Palma. Located in the south of the island directly in front of the see and with a direct access to it. The Hotel has 4 Stars Category and with its completely reformed installations, becomes one of the THB Class hotels. The hotel has 200 rooms, 20 of these are family rooms, with a communicating door between each other, and four of them are suited to handicapped people. Moreover it has 10 single rooms and, for most demanding requirements, 10 junior suites; of course all have a balcony and sea views, complete bathroom with hair-dryer, air conditioning, a safety deposit box with charge and a TV with satellite dish. Our establishment offers bar, the hall-reception, a satellite TV lounge, an Internet connection that works while paying a charge, a restaurant-buffet and a conference lounge for 50 people are also to add.